One of the finest maps of Arabia to appear in the 19th century. Arabia, Egypt, Abyssinia, Red Sea & c.
This is an exceptionally fine example of John Thomson's 1817 map of Arabia, Egypt, and Abyssinia. Centered on the Arabian Peninsula, Thomson's map covers from the eastern Mediterranean to the Horn of Africa, and from the Libyan Desert to Persia. The whole of this map is beautifully engraved in the minimalist English style pioneered in the early part of the 19th century. Relief is shown by hachure with towns, caravan routes, cities, and major topographical features identified. 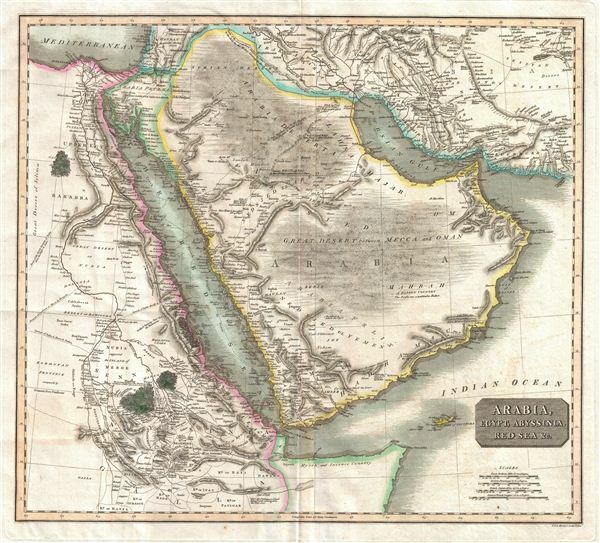 Engraved in 1817, this is the second edition of Thomson's Arabia map and, due to its extraordinary size and detail, is one of the finest maps of Arabia to be published in Europe during the early 19th century. The overall quality and depth of Menzies' engraving is altogether extraordinary and this particular example offers a fine crisp impression, suggesting an early strike off the plate. To create this map Thomson drew information from various sources including earlier maps and contemporary excursions into the region. He identifies several important pilgrimage routes across the Arabian Desert to Mecca, the great Caravan routes from the Nile Valley into the interior of Africa, and the Caravan route from Basra to Aleppo. The 1789 route of the frigate Venus through the Red Sea is especially noteworthy. Vice Admiral Rosily and the Venus explored the Red Sea thoroughly and declared it a practical and navigable avenue for European trade. Previously, the Red Sea had a reputation as dangerous to navigate and was thus largely avoided by the larger European trading vessels. This map deviates from previous versions with regard to the inclusions of more information in the Arabian Peninsula and in the Nile Valley – most of which was most likely drawn from the 1814 – 1816 excursions of John Lewis Burckhardt throughout the region. This map is a steel plate engraving by J. and G. Menzies, and was prepared by John Thomson for inclusion in the 1817 edition of Thomson's New General Atlas. Rumsey 1007.050. Phillips (Atlases) 731. Newberry Library: Ayer 135 T4 1817.